SydeWyrk | Find help with over 20 household chores on SydeWyrk! Jobs you can find help with on SydeWyrk! 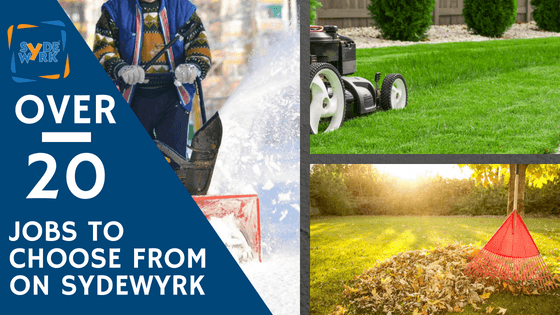 SydeWyrk is changing the way you find help with your outdoor chores. We all live busy lives, therefore you occasionally need an extra hand to get jobs done to keep your home looking its best. SydeWyrk offers over 20 different jobs you can post on our platform. As we continue to grow our platform, be on the lookout for new jobs that you will be able to select from. And if you are registered on the app, we will keep you in the loop as we launch new features! WE ARE, YOUR NEIGHBORHOOD WORKFORCE! Share with your friends and Like our page! Previous: Previous post: Why SydeWyrk?